Sophisticated Wagyu consumers in the West are coming to ask more questions about this delicious beef. For example: What breed is Wagyu ? Increasingly, there are different ‘correct answers’, depending on your location. For example, one correct answer for Japan, and another for the rest of the world. The word ‘wagyu’ is an anglicisation of the Japanese-language ‘wa-gyu’, which simply means ‘our (Japanese produced) beef cattle’. It does not describe any individual breed in Japan, nor is acknowledged as a specific cattle breed name in international animal science literature. Prominent Japanese animal science researcher and academic Mitsuru Minezawa defines contemporary Japanese Wagyu as comprising four distinct breeds, in addition to two indigenous Japanese cattle breeds (Mishima and Kuchinoshima) both of which survive only in non-commercial, trace populations. being the breed known in the West as Red Wagyu, Japanese Poll (trace %) and Japanese Shorthorn (trace %). The full chapter is available on-line here. Finally, the lower priced commodity segment of the Japanese Wagyu beef market is comprised of dairy beef resulting from joining specific bloodlines of Japanese Black sires to breeders within the large Japanese Holstein herd to produce F1 Japanese Black/Holstein (see relative segment pricing in What’s a Wagyu Worth here). Foundation of the Japanese industry, and widely known as Black Wagyu outside Japan, Japanese Black sires represent the ‘marbling gene foundation’ for most of the international industry. Pedigrees must be fully traceable back to Japanese ancestors. There is a small but growing Fullblood (FB =100% Japanese Black) Wagyu beef industry in Australia, with most FB herds built on expensive embryo transfer technology. 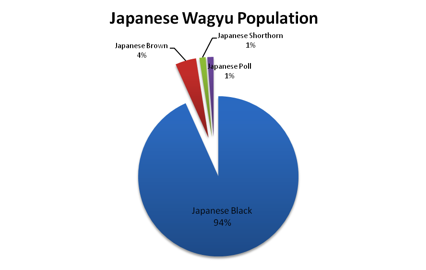 However the majority of Black Wagyu production is based on outcrossing to other breeds, using Japanese Black sires themselves produced by joining several different Japanese Black fullblood strains. Each of these strains originated from unique Japanese prefectural herds with specific phenotypes. See Traditional Bloodlines here. Universally known as Red Wagyu outside Japan, this breed is substantially genetically different from the Japanese Black and is an alternative source of ‘Wagyu marbling’ genetics, reputedly with reduced marbling fineness but enhanced animal growth. Again, pedigrees must be fully traceable back to Japanese ancestors. There are two different strains of Red Wagyu in Japan, described in the Minezawa text, where photos are also available. This is a relatively recent international market cross between fully pedigreed Japanese Black and fully pedigreed Japanese Brown. The combination potentially offers a growth increment over the continuous breeding of the smaller strains of Japanese Black fullblood. There is no ‘Composite’ equivalent in Japanese production. Both in Australia and North America, Purebred herds are the result of joining fullbloods, usually Japanese Black but also JP Brown sires to another (base) breed, often Angus, then rejoining the crossbred progeny to additional fullbloods until over 90% fullblood content is achieved. All generations must be registered with AWA. This was a relatively economical route to large scale production of well marbled Wagyu-style beef given 1990s Australian and American herd commencement situations of very few fullblood sires and no fullblood female herds of commercial consequence. There is no ‘Purebred’ equivalent in Japan. Both the Japanese Black and the Japanese Brown are horned cattle. And although there is a numerically very small Polled breed in domestic Japanese Wagyu production (see Minezawa), the quite different, emerging international Polled Wagyu breed combines either Japanese Black or Japanese Brown (fullblood and purebred in both cases) genetics in an outcross targeting naturally polled sub-breeds, consisting of 100% polled progeny. Within the new sub-breeds, (Black Polled or Red Polled) the polled Wagyu sires may have high value in beef quality improvement in (often tropical) environments, breeding Bos indicus females, where subsequent progeny dehorning required after the use of (horned) fullblood sires can have severe welfare consequences. Polled breeding is also a seedstock industry response to humane lobby criticism of current dehorning practices. There is no equivalent in the Japanese Wagyu industry. F1 or crossbred Wagyu makes up the vast majority of international Wagyu beef production. Mainly Japanese Black sires are used over a wide variety of beef breeds to produce moderate marble score product. Angus are a major temperate zone outcross breed but the world’s Wagyu beef largest producers also cross both Black and Red sires to vast herds of Bos indicus females with high quality results. An additional large F1 Wagyu segment is dairy beef, produced by joining Japanese Black sires to Holstein females. Difficulty in gaining definitive answers about the real ‘breed origins’ of allegedly ‘Kobe beef’ led to some exasperated international media coverage in 2012, notably the April Great Kobe Beef Lie series penned by foodie contributor Larry Olmsted for the leading US business magazine, Forbes. Similar exasperation has been echoed by foodie writers in mass media from Monterey CA to Toronto, Canada. In fact, Kobe Beef is a leading commercial brand of Japanese Black Wagyu beef, although there are many beef brands in Japan, as in the US and Australia. From a Japanese perspective, genuine Kobe Beef can only be produced from Japanese Black cattle bred, raised and slaughtered in Hyogo prefecture, which is the only prefecture in Japan reliant entirely on its own indigenous, prefectural Black Wagyu genetics. In other words, ‘Kobe Beef’ in Japan is an appellation brand similar to genuine French ‘Champagne’ – named for the region of production, and incapable of replication elsewhere. Like competing brands, Kobe aims for a unique quality niche within national Japanese Black Wagyu production. It is otherwise 100% Japanese Black beef. Kobe Beef was awarded protected GI (Geographical Indicator) status in early 2015 and a global expansion of Kobe brand protection is likely. So is the wonderful beef Western foodies revere as ‘Wagyu’ entirely from fullblood Japanese Blacks or Reds ? Obviously not. How do you define the quality differences between Western Wagyu crossbred beef and 100% Japanese Black Wagyu ? It’s almost impossible to organise a ‘taste test’, but analysis of price differentiation between defined grades in the Japanese home market may help answer the question –see details in the ‘What’s a Wagyu Worth ?’ section on this site. And both Australia and the United States do produce relatively small quantities of the finest, fair-dinkum article: fullblood Japanese Black cattle and beef, destined for connoisseur tables across the globe. Something to really look forward to. For the very lucky few in Australia, there is also now the opportunity to taste 100% Black Wagyu raised and fed in Australia to Japanese standards – see ‘Buy Best Wagyu Beef’ on this site. Footnote: Minezawa, M., 2003 Cattle genetic resources in Japan: one successful crossbreeding story and genetic diversity erosion, pp. 71–90 in The Relationship Between Indigenous Animals and Human in APEC Region, edited by H.-L. Chang and Y.-C. Huang. Chinese Society of Animal Science, Taiwan, Republic of China.